We're blessed to have a large group of family and friends, which also means we're pretty busy at this time of year.We attend many family holiday parties over the course of the month of December. Since having had children I've found it can be really helpful to plan ahead and have a few crafts, activities, and recipes up my sleeve that can keep kids entertained (and let's face, just not too wild) while the adults get to visit. Although we're nearing Christmas Day itself, we still have several parties to attend. 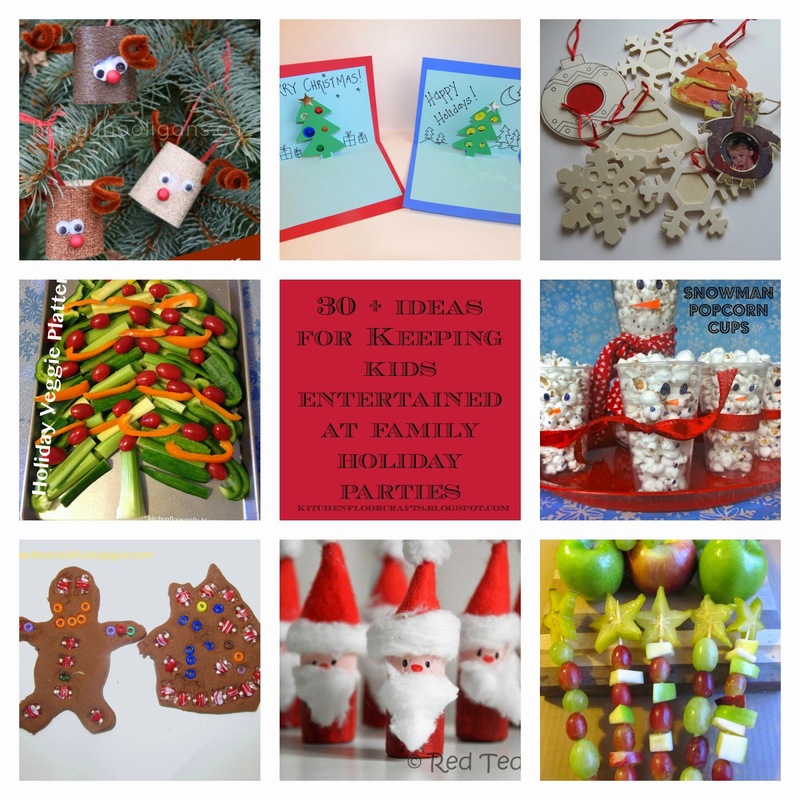 So here's our list of -- Crafts, Activities, and Recipes to Keep Kids Entertained at Family Holiday Parties. In my few short years as a mom, I've realized that it's not very likely kids will eat a whole lot at these fun and exciting events, so I don't always try to push eating a full meal during these types of events. Instead, I often make sure they've had a good meal earlier in the day and I plan to bring a few food contributions that I know they can't resist. 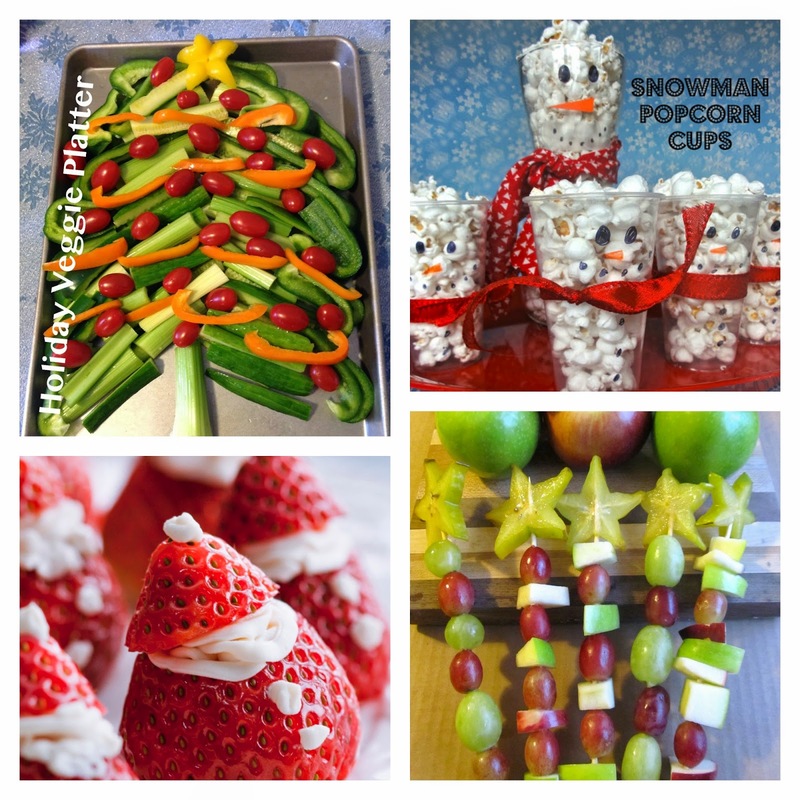 For my kids that tends to be things with fresh fruit and veggies, as well as cheese and crackers. 1. My guys, and many of our kid family members, love our Holiday Veggie Platter. 2. Several times this year already we've created Christmas Fruit Wands, and they tend to disappear at events with kids. 3. We made something similar to these Grinch Party Poppers for Christmas Morning Breakfast last year. Creative Kids Snacks put a great spin on it by adding his face to the grapes. 4. Creative Kids Snacks also shared these adorable and festive Snowman Popcorn Cups. 5. My mother-in-law makes a big tray of these Strawberry Cream Cheese Santas every year, and neither kids or adults can resist them. 6. I love the look of both these pretty and yummy looking Festive Cabot Cheddar Tree platter and Holiday Cheddar Star from Cabot. 7. These Mini Fruit Pizzas from Frogs Snails and Puppy Dog Tails are pretty and easy. 8. A parent made something similar to these Star Cheddar Crackers for Big Brother's family preschool party this week, and my kids and I couldn't resist them. 9. This Easy Holiday Snack Mix from Sunshine and Hurricanes looks like a festive spin on chex mix. 10. Fantastic Fun and Learning has such a simple idea for a Healthy Christmas Tree Snack using celery and cream cheese. Although the kiddos usually just want some time to free play, I've also found it's good to have a few games and activities planned too. Usually I decide to do them just as kiddos might be getting a little extra wild or "squirrely." 11. We have a new tradition of filling a holiday piñata for the largest of our family parties. We fill it with things like tattoos, stickers, holiday stampers, pencils, and candy. 12. Inspired by Family has this great idea for Christmas Carol Charades. 13. When I was a kid we had to put on a "show" before we could open presents, I've definitely started this tradition now that the kids are a little older. They have to plan it and perform it between dinner and opening presents. 14. This one could get messy, but it definitely looks fun, Shaving Cream Snowball Toss from Inspired by Family. 15. When I was a kid my grandmother had a "Pin the Nose of Rudolph Game" which she sometimes still has us play. You can always create your own version too. We made a "Pin the Carrot on the Snowman" game this year using poster board, permanent markers, and construction paper. 16. Teach Preschool has some great ideas for games for younger kids, including creating a holiday ornament toss. 17. Red Ted Art has this adorable idea for a DIY Santa Bowling idea using corks. 18. Keeping it Simple also has a bowling idea with these cute homemade Christmas bowling tins. 19. Kids Creative Chaos put together a great list of Christmas games that would be fun for adults and kids alike. 20. Why not be inspired by the 12 Days of Christmas and do some different "Lords a Leaping" jumps in a safe place as suggessted by 3 Dinosaurs? 21. 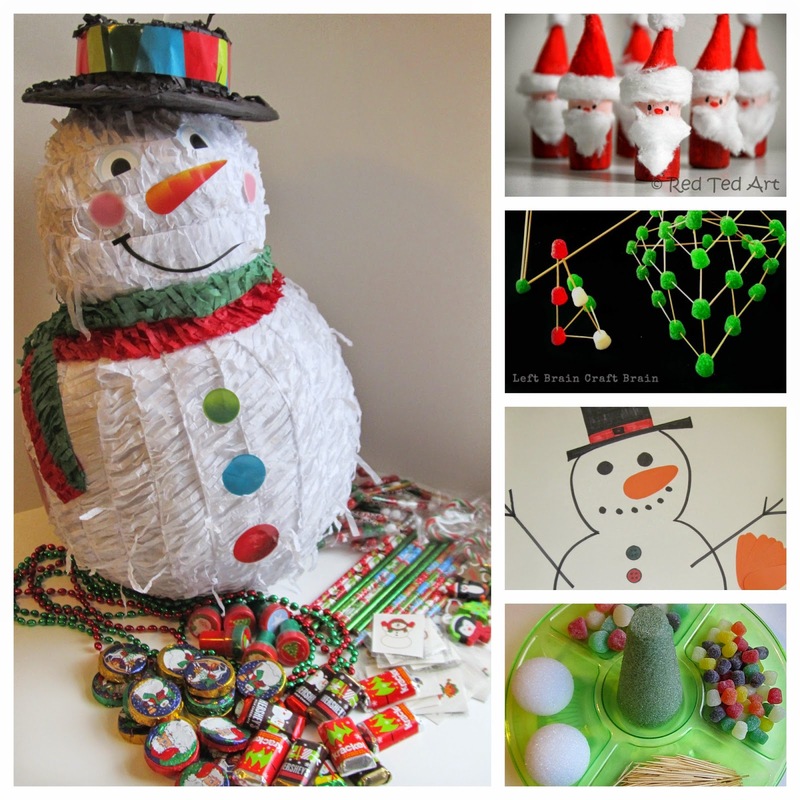 Another fun idea is to put out foam shapes and gum drops, and let kids make gumdrop trees or gumdrop ornaments. Or, you can use tooth picks and have kids build cool tree designs like Left Brain, Craft Brain did. 22. Playdough can also be a fun station for kiddos, our most recent Gingerbread Baby Playdough is definitely a crowd pleaser with it's sweet and spicy scent. 21. Decorating plain wooden ornaments has been a huge hit several years in a row at one of the parties, and I've kept many of the creations on our family tree. I usually try to have something in mind for how kiddos will get wet ornaments home. 22. These Paper Plate Christmas Tree Hats from the Imagination Tree are so cute and fun. 23. Often the kids just love decorating and taking home (or sometimes just eating) sugar cookies. 24. These Craft Stick Stars are a colorful and easy idea from Powerful Mothering. 25. A Button Christmas Tree Ornament from over at Hands On : As We Grow would be a sweet craft to bring home. 26. 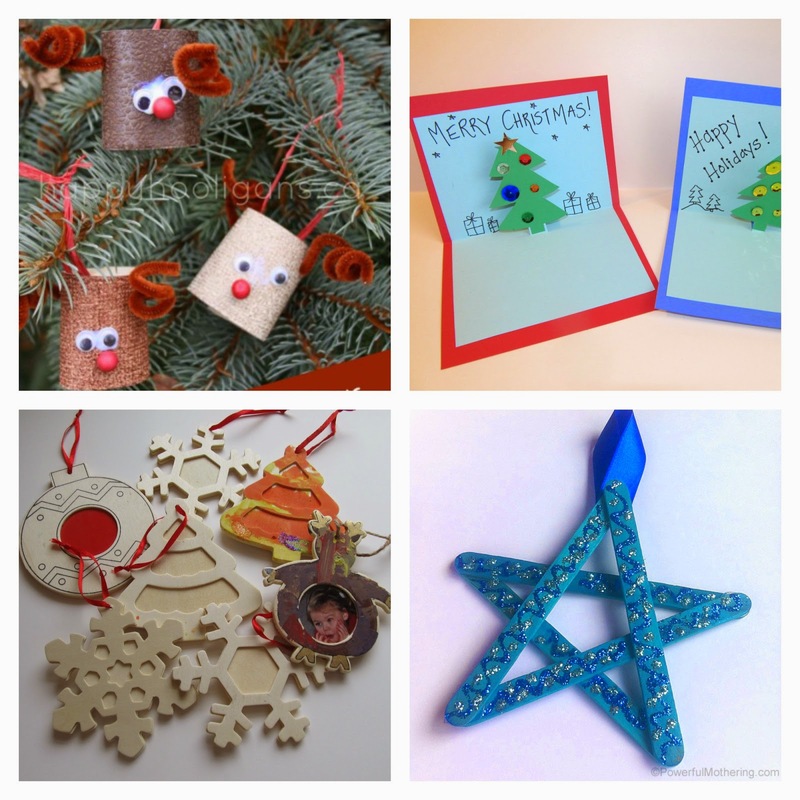 Kids can also just create holiday cards, like these Easy Christmas Tree Pop-Up Cards. 27. Coloring pages and coloring books, with lots of crayons and markers can keep lots of kids entertained for quite a while. 28. Toliet Roll Reindeer from Happy Holigans are easy, cute, and use recycled materials. 29. Kids could make a smaller version of this cardboard christmas tree using preassembled cardstock trees. 30. This egg carton reindeer craft from Crafty Morning is definitely doable with a crowd of kids and easy to come by the needed materials. Whether you still have some holiday parties to attend, or whether you're going off to college and looking for some to do at home hopefully there are some ideas here!